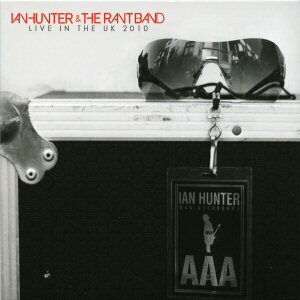 Ian Hunter and The Rant Band CD: "Live In The UK 2010"
This show is an absolute joy to listen to. Being "unplugged" allows it to stand out from the other Ian Hunter live albums that are available. The tracks are a mix of old and new, with the older tracks benefitting from the acoustic arrangement. I'll readily admit that Man Overboard (the album being promoted here) isn't my favourite Ian Hunter album, but the four tracks from that album (Arms And Legs, Flowers, The Great Escape and Man Overboard) sound fresh and vital. Older material sounds good too - Wash Us Away and Soul Of America stand out, while 23A Swan Hill would sound good in any setting. Strangely, All The Young Dudes sounds out of place. This is the first album to be released through Ian himself (ie his own label) and not via a normal record deal. It is, however, available through all the usual channels (Amazon, etc). You can also order it from Ian's own site - as well as the physical disc such customers also get a free mp3 download. In summary, this album won't disappoint and is sufficiant to keep us going until the next studio album.